Four of Mario's alternate costumes in Super Smash Bros. Brawl. Mario and Greninja with their alternate costumes in SSB4. In the Super Smash Bros. series, each character has a set of alternate costumes (officially known as color changes). Alternate costume is sometimes known as color or alternate color. In addition to changing the appearance of characters, they distinguish players from other players using the same character. For Team Battles in Super Smash Bros, Super Smash Bros. Melee, and Super Smash Bros. Brawl certain costumes also distinguish teams. In Super Smash Bros. and Melee, most characters have purely color-based alternate costumes, while Brawl, Super Smash Bros. 4 and Super Smash Bros. Ultimate introduce a number of alternate costumes changing entire outfits and even characters. In standard free-for-all matches, players can choose their character's costume on the character selection screen. Players cannot pick the same costume if they are using the same character. Every character has at least four costumes to choose from, one being their default costume and the rest being their alternate costumes. In Brawl, randomly chosen characters may also have a random costume. For Team Battles in Super Smash Bros., Melee, and Brawl, there are three teams: red, green, and blue. As such, each character has red, green, and blue costumes that double as team colors. 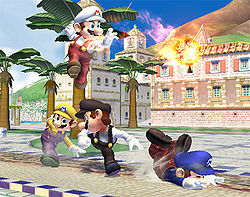 Some characters' default costumes also represent a team color; for example, Mario's default costume is red, so he wears his default costume when fighting on a red team. In the original Super Smash Bros., some costumes are only usable in Team Battles, such as Samus and Captain Falcon's blue costumes and Mario, Kirby, Donkey Kong, and Captain Falcon's green costumes. In Brawl, Wario has 12 alternate costumes with six color variations of his WarioWare costume and his classic overalls. Each variation has red, green, and blue colors usable for Team Battles, making Wario the only character in Brawl with two color choices when on a team. If two or or more characters share the same alternate costume in Team Battles or online multiplayer, the second player will have a lighter tint in their appearance. A third player uses a darker tint, and in Melee, a fourth is completely black. Data suggests that a fifth player would be completely gray. In SSB4, due to the increased number of possible players with introduction of 8-Player Smash, players can choose from four different teams. Teams are indicated by a red, green, blue, or yellow outline around the character, so players can choose whichever alternate costumes they like in Team Battles. Mii Fighter colors match their colors chosen in Mii Maker. Players can unlock or download different outfits and headgear to select for their Mii Fighters to wear. Some outfits are only available for certain Mii Fighter types, and some outfits have minor differences depending on the gender of the Mii Fighter. Each Mii Swordfighter and Mii Gunner outfit comes with a differently designed sword or gun, though they all function the same. Identical Mii Fighters do not bear any visual differentiation. The appearance of alternate costumes for the majority are simple change in hue, but some alternate costumes have more pronounced changes, like adding new patterns, textures, pictures, and text, and even the addition of accessories. Many of these types of alternate costumes reference the character's earlier or alternate renderings, such as Mario's "Jumpman" blue, or to other characters, like Peach's "Daisy" alternate costume, Luigi's "Waluigi" alternate costume, Captain Falcon's "Blood Falcon" and "Jody Summer" alternate costumes, Fox's "Slippy Toad" alternate costume, Link's "Dark Link" and "Fierce Deity" alternate costumes, Lucas' "Claus" alternate costume and Jigglypuff wearing Sleep Kirby's nightcap in Brawl and SSB4. A small number of costumes reference other costumes within in the Super Smash Bros. universe, such as Melee Jigglypuff's blue bow from the original Super Smash Bros., Pikachu's goggles previously worn by Pichu in Melee, and R.O.B. 's "R.O.B. Launcher" green. Some alternate costumes are more drastic changes such as giving the character a new model, voice, sounds, and for some characters, gender. A few characters have alternate costumes that change the entire identity of the character, although gameplay wise they are exactly identical to their base character. Ice Climbers is a unique case in that their alternate costumes determine whether Popo or Nana is controlled by the player. Pikachu, Jigglypuff and Pichu all wear colored hats and accessories instead of significantly changing color. Pikachu (Ultimate): Pikachu has two female alternate costumes, indicated by its heart-shaped tail. One is a standard female Pikachu wearing Moon's Casual Cap from Pokémon Sun and Moon; the other is a Cosplay Pikachu wearing the Pikachu Libre costume which debuted in Pokémon Omega Ruby and Alpha Sapphire. Pichu (Ultimate): One of of Pichu's costumes is the spiky-eared Pichu from Pokémon HeartGold and SoulSilver. Sonic: All of his costumes have different modeled cuffs. Pac-Man: Five of his costumes have the Wing Shoes power-up from Pac-Land. Six of them add a colored arm band. Bowser Jr.: All seven of his alternate costumes are the seven Koopalings, all who ride mass-produced Junior Clown Cars. They have their own unique announcer sounds, crowd chants, voices, and, in Ultimate, use their wands in place of Bowser Jr's Hammer. Olimar (SSB4, Ultimate): Four of his alternate costumes replace Olimar with Alph. Alph has his own unique announcer sounds and crowd chants. Wii Fit Trainer, Robin, Corrin, Pokémon Trainer (Ultimate): These characters have male and female variants as alternate costumes, which also results in new voice lines and different announcer calls in certain languages. The Pokémon Trainer's female variant doesn't affect the actual Pokémon, however. Villager, Inkling: These characters have male and female variants, as well as additional changes between outfits, like hair and clothes. Villager's outfits are retextures of either a shirt or a dress, while Inkling has entirely different outfits for all variants. It should be noted that Inkling has different voice clips between the two genders, while Villager remains muted. Wario: Wario has alternate costumes which use his classic overalls. His was the first instance of a major alternate costume change, and the only one of such in Brawl. Little Mac: Little Mac has alternate costumes which uses his wireframe model which was used in the original arcade Punch-Out!. He also has an alternate costume which uses his pink sweatsuit, as well as another alternate costume with wireframe Mac wearing a sweatsuit. In Smash 4, Little Mac had 8 costumes for both regular and wireframe versions, giving him the most alternate costumes ever among all characters with a total of 16. Zero Suit Samus (SSB4, Ultimate): Zero Suit Samus has two alternate costumes based on the crop top and shorts worn in the endings of Metroid: Zero Mission and Metroid Fusion. Shulk: Shulk has an alternate costume based on his swimsuit armor set from Xenoblade Chronicles. Cloud: Cloud has four alternate costumes based on his appearance in Final Fantasy VII: Advent Children, with him wielding the Fusion Swords instead of the Buster Sword; two of these cover his Geostigma-infected left arm with a sleeve, and the other two reveal his left arm sans sleeve with Aerith Gainsborough's ribbon wrapped around it. Bayonetta: Bayonetta has four costumes based on her appearance in Bayonetta 2, where she wields Love is Blue, and another four based on her appearance in the original Bayonetta, where she wields Scarborough Fair. The sounds their guns make are different, as they are in the Bayonetta series. Mario (Ultimate): Mario has a costume where he's wearing his wedding tuxedo from Super Mario Odyssey and another which uses his builder outfit from Super Mario Maker. Link (Ultimate): Link has alternate costumes where he wears the Tunic of the Wild from Breath of the Wild, which closer resembles his classic design. Ike (Ultimate): Ike uses his Path of Radiance appearance by default, and his Radiant Dawn appearance as alternate costumes. His voice has a slightly lower pitch in his Radiant Dawn costume. Ridley: Ridley has two alternate costumes which use his Meta Ridley form. Isabelle: Half of Isabelle's costumes use her long sleeved Winter outfit. Piranha Plant: Piranha Plant has alternate costumes where it is in a Warp Pipe, whereas its default costume is in a flower pot. Joker: Joker has two alternate costumes based on his Shujin Academy school uniform. He removes his glasses as opposed to his mask when summoning Arsene. 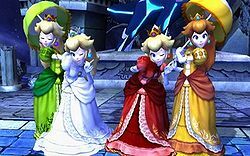 Peach (Melee): Unlike in Brawl and Smash 4, where her Daisy costume is simply a recolor of Peach with Daisy's colors (such as having long hair and gloves, while Daisy's hair and gloves are shorter), Peach's Daisy costume in Melee is an exact recreation of Daisy's design at the time, aside from the bangs. Mii Fighters: Unlike all the other characters, the Mii Fighters have customizable designs comprising of unique headgear and outfits allowing the player to customize their designs, instead of simply just recoloring their clothing. The average number of alternate costumes per character is roughly 4.7 in Super Smash Bros. and Melee, 6 in Brawl (with the exception of Wario, who has 12), and 8 per character in SSB4 and Ultimate (with the exception of Little Mac in 4, who has 16). Ultimate is the first game where all characters, not counting the Mii Fighters, have the same number of alternate costumes each, with them all simply having just 8. In Ultimate, the game loads default costume character portraits on the character selection screen first, and then loads alternate costume portraits in character order. This can result in characters' alternate costume portraits not being displayed for several seconds, as the game is still loading them. In Melee, each of Captain Falcon's costumes slightly change his character model's width, minutely affecting when he collides with stage elements. In SSB4, Dr. Mario, Dark Pit, and Lucina were originally intended to be alternate costumes for Mario, Pit, and Marth, respectively. However, they were separated into different characters once they were given differentiating gameplay characteristics. In SSB4, Alph was intended to be a clone of Olimar, complete with the ability to pluck and command Rock Pikmin. In the final game, however, Alph became a model swap for Olimar. In Brawl, there is a glitch that allows the player to use the same costumes as each other offline. Zelda is the only playable character in Smash to sport an alternate costume that would inspire her default design in a subsequent game. In this case, in SSB4, she reuses her Twilight Princess design from Brawl, but now has an alternate costume based on her appearances in A Link to the Past and A Link Between Worlds, which eventually became her current design in Ultimate. Consequently, her Twilight Princess design is relegated to simply an alternate costume in Ultimate. SSB4 is the only game where the entire playable cast from Super Mario 3D World (except for Toad, who is merely one of Peach's moves, and not being playable here) have alternate costumes based on the Fire forms from that game (Luigi, on the other hand, is the only one of those four characters to have his Fire form appear in all of the Smash games, as Mario never had a Fire-based costume prior to Brawl, only to have that costume along with his Wario-based costume removed in Ultimate to make room for newer, more unique costumes based on Super Mario Maker and Super Mario Odyssey, respectively, and Peach never had a Fire-based costume until SSB4). Ike and Bayonetta are the only characters whose sound effects and voice clips (specifically in the Japanese version for Bayonetta) change depending on the costume, but do not change into separate individuals. In addition, Wario in Brawl, and Cloud, Bayonetta, and Joker in all of their appearances are the only characters who have different artwork for their alternate costumes, but do not change them into a separate individual. Ike is the only character whose default costume became an alternate costume in a later installment. This is not counting characters such as Wolf and Zelda, whose default colors are now alternate colors rather than costumes. This page was last edited on April 19, 2019, at 23:29.